The New Jersey rock crew’s sophomore album is out February 12. 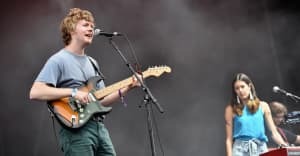 Montclair, NJ-based rock band Pinegrove describes themselves as "a group hard at work in the promotion of introspective partying." Their chipper yet reflective pop-rock makes good on that claim. Last October, they announced their signing to Boston's independent label, Run for Cover, joining a roster of artists we like including Spencer Radcliffe, Elvis Depressedly, and Makthaverskan. They also re-released their immense 21-track treasure, Everything So Far. Today, we're premiering "Cadmium," the latest leak from their sophomore album, Cardinal. With quietly lustrous picking that evolves into coursing power chords, the track serves as an assuaging depiction of one's struggle with the weight of honesty. Frontman Evan Stephens Hall documents an inner turmoil, claiming that saying that it's impossible for him to say what it is. He later muses, But if I just say what it is, it tends to sublimate away. "The song's a lot about correspondence and communication," Hall told FADER in an email. "There's a book called I Send You This Cadmium Red by John Berger and John Christie that collects the letters the two Johns sent to one another. The first letter sent was just a square of that color. I was writing a lot of letters with my friend out west at the time, and we liked the idea. We started sending colors and art sometimes and found it to be a different and good (and sometimes more direct) way to say what we were feeling." Cardinal is out on February 12 via Run for Cover.